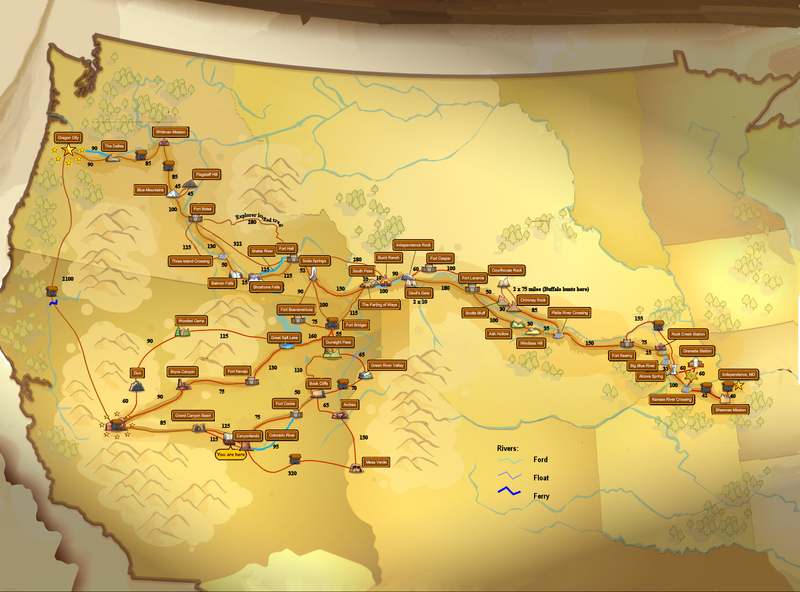 The Oregon Trail Home / How much food do I need? How much food/stamina/time do I need? It's possible to work out how much food you need to complete the trip at any destination on the map. You'll need 1 stamina for every mile travelled no matter what pace you set. Below is a table which shows destinations and their distance from Oregon City and how long it will take at grueling speed assuming no delays. It also shows the last date you must set out by if you are to get to OC by December 21st. Beware of the dates given. These are the days you MUST leave by and assume nothing will slow you down on the trail such as mud, storms, buffalo hunts etc. If these occur your journey will take longer. You can often counter slowdown events by using speed boosting items such as red hot chilis but delay items such as getting lost or a buffalo hunt have to be allowed for. The maximum a wagon can carry is 2700 lb. To this you can add food stored in your inventories.